One thing most people don’t know about me is how big a part theater played in my childhood. My parents, Harold and Tanya, began their theater lives before I was born. They were in the first wave of inhabitants of the original Levittown on Long Island after World War II. I was born in nearby Glen Cove Hospital, where Roy Campanella was taken after his car crash in 1958. The year I was born, my parents wrote the score for the Levittown Follies of 1951, performed as a benefit for local chapter of the Jewish War Veterans, "proceeds for Civilian Defense" according to the program. My mother performed in the opening number, "Our Town". I wish I had the sheet music for the score, since the song titles present an array of diverting, early suburban concerns: "Rockin' 'n Rhythm," "Pick a Bone," "A Levittown Car Pool," "You Don't Know What You're Missin'," "A Restful Sunday," "The Lumpett Home of 1960," "Election Day in Levittown, a ballet titled "Waltz Des Fleurs," the "Village Green Polka," and a number called "Hindu Boogie," featuring the show's choreographer, Belle Berkowitz, which must have been something to see. In 1952, when I was one year old, my parents escaped New York City, making it all the way across the George Washington Bridge and eight miles beyond, to the town of New Milford. That same year, they joined the Bergen County Players, which was already a couple of decades old. The BCP has long inhabited the Little Firehouse Theater in Oradell. It’s a three-story firehouse with a 200-seat theater which has seen eight or nine productions a year for nearly a century and is still going strong. My mother acted in upwards of a dozen plays, usually character roles like Mrs. Gibbs in Our Town. My father worked backstage with lights and sound; he didn’t get the only role that would have put him on the stage, Nicely-Nicely in Guys and Dolls. They had seen the original production on Broadway three nights before I was born, and "Sit Down, You're Rockin' the Boat" was my father's favorite song to sing while driving. More than that, my parents wrote the original score for a musical produced by the BCP in 1953. A Western titled Stake Your Claim, it features my father’s music and my mother’s lyrics. My father had gone to New York in 1930 to stake his own claim to a place as a songwriter. That career didn't happen, but he found his love and his lyricist instead. They idolized Cole Porter and Frank Loesser for their wit, and my mother’s lyrics were cleverly Porteresque. I not only have the sheet music for Stake Your Claim, I have the cast album. Linda and I listened to it many times. Her favorite was the song about a bashful cowboy, "Orson, Quit Horsin' Around," I lean toward one of the love songs, "How Did This Happen To Me?" I'm appending her lyrics to "When 3-D Comes To TV," performed during one of two "TV Interludes" (there's a later radio interlude). Like Cole Porter, it was built around a risque theme, intricate rhymes, and topical references. If any of the historic ladies doesn't ring a bell, you'll be happy to checked them out on Google Images. And you'll see what my mother was getting at. The Bergen County Players became the social hub of our lives. Every month, the BCP dress rehearsal was "players night," when members brought their families. If it was a comedy, my mother was required to sit in the last three rows; her laugh was so robust and loud that it disconcerted the actors at close range. I often attended rehearsals and still remember Herb Hackbarth sitting in a chair with no lines to speak. All he had to do was smoke a cigarette and sip a scotch. Absorbed in the drama in front of him, he absent-mindedly took a sip with the cigarette dangling from his lips and almost choked to death. Opening nights were a big deal if my parents were involved, and I'd either watch my mother act from the front row or sit in the back with my father and help with the light cues. Afterwards, everyone repaired to Hagler's, the bar across the street. I broke a toe during one post-opening night party at Hagler's when some adult stepped on my foot; I was seven or eight. One of the members, Bob Schmitt, worked at one of the big television networks in NYC and had access to the film library. During winters, one night a month was ”silent movie” night at the theater, packed with members and families. That’s where I first saw Chaplin, Keaton, Lloyd, and Langdon. I especially remember a lot of Chaplin one-reelers like "The Rink" and "One A.M." There were pool parties in the summer, a big Christmas party at the theater, and all those plays. I recently found my old hometown newspaper—the Bergen Record—online for the first time, and my first search was for my parents’ BCP doings. What a bonanza! First, the review of Stake Your Claim claimed that it had “humor, heart, melody, and pace,” which is how I would describe the cast album. It’s good stuff. Among my coolest finds were photos of my mother in two of the productions: You Can’t Take It With You and The Middle of the Night, a Paddy Chayefsky play. I have her Samuel French copy of the Chayefsky, which we used so I could "read lines" to her. She played a substantial role, making a well-meaning but misguided attempt to find a woman for her grieving brother, a role created on Broadway by Edward G. Robinson. I found uniformly fine notices for her. The reviewer of The Fifth Season wrote, “As his wife, Tanya Schechter is attractively appealing in a modern version of Ibsen’s doll-wife, Nora.” A 1961 review noted that she and another actress “have given a long list of memorable performances in past seasons.” My favorite is the review of Our Town, in which she and the actress who played Mrs. Webb were commended even though the reviewer found them "too young to be convincing as mothers." At the time, my mother was 42 years old and had an eight-year-old son. My parents and I in 1963, when my mother was 46. Those were all preliminary findings, however, compared to the big quest—anything I could find about my one appearance on the stage. When I was five years old, I was in the BCP production of The Seven Year Itch, a Broadway hit which had been made into a popular movie remembered mostly for the iconic shot of Marilyn Monroe’s white dress getting ruffled. My four lines done, off I went to the chauffeured. . .excuse me, to the family Ford, to be whisked home and readied to go to bed. I was only five, after all. I never did see the play, and by the time I got around to seeing the movie, I could appreciate it fully. Special mention must be made of the outstanding performance of young Gabriel Schechter, who portrays Ricky, the Sherman’s [sic] son, with brilliance and sincerity. In four lines? I have already testified to my sincerity with “poor Daddy,” but how brilliant could the other two lines have been? Look at me. Sincere, yes, but sedentary at best. It's a declamatory posture I don't recall seeing in any Olivier bios. Or was something else going on? Others in the cast include Judy Lash, Joan Cole, Doris Wheeler, and Ted Lash, with 5½-year-old Gabriel Schechter threatening to steal every scene in which he appears. Excuse me? How many scenes was that? It sure sounded like more than four lines. I was a hyper little kid, so maybe I was like a Marx brother, running wild during rehearsals and stealing scenes I wasn’t even in. Did little Ricky have several scenes which I overwhelmed so thoroughly that they were dropped from the final production? I didn’t think so, because the memory of going home right after the scene has always been pretty strong. On the other hand, I couldn’t dismiss the possibility that the director realized that if he cut me down to just the opening scene, they wouldn’t have to deal with me the rest of the night. My theory was that the publicity maven thought, “nice touch—Harold and Tanya will get a big kick out of that.” The Lashes, Joan, and Doris should have gotten a better agent. I’m sure my parents did get a kick out of it, though probably not as big as I did 62 years later. It took me awhile to get my hands on a copy of the George Axelrod play so I could clear up the mystery of just when and how often I stole what. It arrived yesterday, and the suspense lasted only while I thumbed through it. For once, memory won--I had exactly four lines, and I disappeared from the play after the first five pages. Ah, but what lines! I thought "poor Daddy" was my second and fourth line, with the other two lines equally brief and scintillating. But no. That lament was the entirety of my final two lines, the last delivered as the light fades and the scene returns to Ricky's father. However, the first two lines consisted of three sentences and a whopping 19 words. Richard Sherman is a 38-year-old Manhattan businessman, perfected on Broadway by Tom Ewell, who also wooed Marilyn Monroe in the film version. He's reflecting on the scene yesterday when he sent his wife and son off to New England for the summer. He recalls little Ricky being "really upset when they left for the station. It was very flattering. I thought the kid was going to cry. . .
RICKY: But what about Daddy? Isn't Daddy coming with us? HELEN: Daddy'll come up Friday night. RICKY: But, Mommy, why can't Daddy come up with us now? She explains that Daddy has to stay in the city and make money, so he'll only be able to visit them on weekend. Poor Daddy. She tells him that not only does Daddy have to work and make money, he's giving up cigarettes and alcohol for the summer. That brings the final, plaintive "poor Daddy. . . ."
Plenty of room for sincerity, and no doubt I nailed it. The "Who's Who" in the program assured patrons that "Gabriel Schechter, of New Milford, is making his debut in this production. His flare for dramatics comes natural, being the son of members of the players." The little scene-stealer! I retired my flare after that, auditioning for one BCP show as a teenager. Some other time, I'll tell you about the short film I starred in during grad school. There's an odd postscript to my quest for the truth about The Seven Year Itch. The review appeared in the Bergen Record published the morning of October 8, 1956. 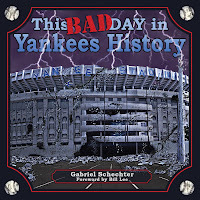 As my baseball friends know, that was the day Don Larsen pitched his perfect game in Game 5 of the World Series at Yankee Stadium. Don Larsen lived in Bergen County. In fact, we had the same physician, Dr. Philip Pollack, who got Larsen to sign a postcard to me that winter. If I were writing a novel, we would see Larsen at the breakfast table, eating a hearty meal while reading the review. He exclaims to his wife, "By golly, that little 5 1/2-year-old kid was brilliant, wasn't he? I never saw anything like it. Maybe I can do something special at the ballpark today." That would have been complete fiction, of course, for several reasons (starting with "by golly"). Larsen stayed at a Manhattan hotel during the World Series and went out drinking that Sunday evening. Besides, he didn't even know he was starting Game 5 until he got to the ballpark on Monday. Still, I can imagine it all I want. I can even think that somewhere out there is a person who attended both performances, or there was. The cosmic connection will stay with me always. Thanks, Don. TV in three dimension is coming at you. And our most delightful portions are projected at you. Will make your imagination run away from you. Will rouse your masculinity in a way that’s new. With figures so blistery will pop into view. Will imagine that he’s Louis on the throne. But he’ll never, never, ever sleep alone. And she starts to take the veils off one by one. Then 3D will seem like heaven. Well, until the sponsor cuts into your fun. Will make her 3D debut any day. Why there’s no telling what requests will come her way. And she wouldn’t even have to speak a line. That’s when two dimensions look like more than three. When you get that double vision on TV. Will make your imagination run away with you. From now on will be lungin’, boys, directly at you. Will start to act like rabbits adding two and two. adding two and two and two and two and two. I was a late arrival to the Jane Leavy party. 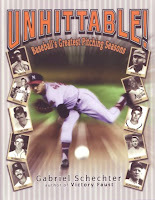 Though her first baseball book, a much-acclaimed study of Sandy Koufax, one of my favorite players from childhood, was published in 2002, it took eight years for me to get around to reading it. It was well worth the wait. Also in 2010, The Last Boy, her even more acclaimed book about Mickey Mantle, was published. Another eight-year gap followed during which I acquired the book but never got around to reading it. Last summer, I read it and saw why so many other people had responded to it. Like the Koufax book, it reflected Leavy's dogged research and a desire not only to pin down nagging questions about her subject's career and life, but also to frame these discoveries in terms of what they meant to the subjects themselves. One other thing--both books revealed Leavy to be a very fine writer. I didn't dawdle this time. The Big Fella, Leavy's 2018 book about Babe Ruth, tackles an even bigger subject than Koufax and Mantle, idols of their times. 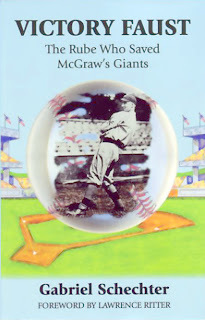 The original sports icon, Ruth has always been a gargantuan target for authors, and Leavy's treatment of his oversize life and legend is correspondingly more far-ranging and depth-plumbing than the earlier books. If it isn't the definitive book about Ruth, we aren't likely to find its successor in our lifetimes, if for no other reason than the increasing scarcity of living people who knew Ruth. I will lend my voice to the chorus of reviewers who marvel at Leavy's success in tracking down people who intersected with Ruth in some way. Not only did she find them, she unearthed their own life stories to see how an encounter with Ruth might have colored entire lifetimes. For instance, there are the brothers who insisted that they were in a photo taken with Ruth, displaying copies of the photos in various businesses and offices for decades, until learning that the photo was taken somewhere else, three years before the day they saw Ruth. The son of the man who had identified himself as the boy in the photo with the black eye and the cold sore decided to leave the photo on display. Ninety years after that day when Ruth came to town, people still cherish links to Ruth. One of the many beautiful things about this book is seeing how dramatically Ruth affected those who idolized him. There is a wonderful two-word phrase in this book which Leavy uses to describe the birth of advertising and public relations in the 1920s--just in time to capitalize on Ruth. She calls it "opportunistic connectivity," a phrase which instantly brought an echo in my brain of that Shakespearean description in Julius Caesar of "multitudinous seas incarnadine," another polysyllabic summarization. She refers to the phenomenon of someone like Ruth creating an almost uninterrupted source of material for anyone who wanted to make money off his deeds and his fame. In fact, the phenomenon still exists in the two branches of Ruth's descendants, both mounting websites to claim their pre-eminence as the branch which should most benefit today, 70 years after his death. One of the many highlights of this book (don't get me started on the delightful saga of Lady Amco) is Leavy's thorough--and thoroughly demoralizing--history of the Baby Ruth candy bar. Though demonstrably intended to exploit Ruth's name, the candy never earned a penny for him and his descendants, not even when the brand was sold a decade ago for $2.8 billion. I'm a morning reader, and I have spent the past five mornings happily diving into the excesses, the glories, and the ultimate sorrows of Ruth's life. There is a wealth of detail here, and Leavy pinned down so many things. Her work on untangling various issues of parentage and cohabitation is probably heroic. If she didn't touch on something, it must be because she decided it was covered sufficiently elsewhere, such as Ruth's infamous piano or relations between Claire Ruth and Eleanor Gehrig during their shared status as revered widows. Still, I'd like to know more. In a similar vein--that is, much like someone who has just devoured a feast worthy of a Babe Ruth breakfast, capped by six pieces of apple pie a la mode, yet still wishes there had been pecan pie as well--I want to say something about the photos. They are all remarkable and telling in various ways, and informatively captioned. The problem is that there aren't enough of them, only sixteen. A book like this should have had at least twice as many, particularly because Leavy goes to the trouble of giving readers vivid descriptions of many photos not on display here. As wonderful as her several hundred words are, the photos would have told us still more. When I worked at the Hall of Fame library and gave tours that included the photo collection, I always showed off just one file, the one with photos of Babe Ruth and children. It wasn't the thickest Ruth file but it contained dozens of photos, many of which had never been published. Many were taken on barnstorming tours like the 1927 post-season tour around which Leavy frames her narrative. At every stop on the tour, Ruth's manager, Christy Walsh (given his full due for services rendered to Ruth over the years) arranged visits to hospitals and young groups (including Boys Town in Nebraska), at which Ruth obliged anyone who wanted to photograph him doing anything. There was no pose too silly or trivial for Ruth, whose affinity for children is well-documented here and elsewhere. When I went through the file with people on tour, Ruth's childlike joy jumped out at us from so many photos--doing chin-ups with five-year-olds, playing Santa Claus, cheering sick kids--that it became an instant antidote to the urge to make something superhuman out of a man who, as Leavy shows us in many ways, couldn't stand being alone and had the most fun around people who were happy to see him, chiefly kids and fans. Here's what Jane Leavy and I know about a different kind of connectivity from the opportunistic slant of the hucksters of the past century: many of the photos in that file were donated by people in them. One I always think of showed Ruth on the field with a young girl who gazed raptly up at him. I recall the name of the girl as Jean Farrington, and the photo was taken during Ruth's career, perhaps on the tour chronicled in Leavy's book. It was donated to the Hall of Fame in the 1990s--by Jean Farrington. Think about the lifetime that passed between the day she gazed up at Ruth and the day she decided to share her wonder with the Hall of Fame--and unknowingly with an uncountable number of people who have looked at it and will look at it. That is the meaning and the legacy of Babe Ruth, and that is what Jane Leavy has captured with sensitivity and eloquence in The Big Fella, the extraordinary tale of a man in whose aura we continue to bask.